The bronze electric light standards (left photograph) are displayed in The East Room along side the large majestic fireplaces. I trimmed these elegant bronze light standards many years at The White House. I am using fresh cut evergreen garland that I made along with other designers the day before to trim the standards with. They looked so elegant when decorated with assorted fresh holiday greens and berries wrapped around the bronze standards. Red velvet bows are the finishing touches when completed. When the lights are all lite up in The East Room, and the decorations are all in placed, it is a most beautiful scene to view for Christmas. The East Room is for very large formal State Dinners and White House parties and evening entertainment by great performers from all over the world. It is the largest room in The White House and is also the home of The White House Nativity Scene display and The Christmas Gingerbread House display created from the baker's kitchen. Reagan Administration. The East Room is the largest room in the White House. It is used for entertaining, press conferences, ceremonies, and occasionally for a large dinner. The White House's oldest possession, the 1797 Gilbert Stuart portrait of George Washington rescued from the 1814 fire, hangs in the East Room with a companion portrait of Martha Washington painted by Eliphalet F. Andrews in 1878. The Steinway Grand Piano, donated by Steinway & Son in 1936 in the Franklin D. Roosevelt Administration. mostly in the East Room and sometimes on the State Floor for musical entertaining. Photo shown is the State Floor. 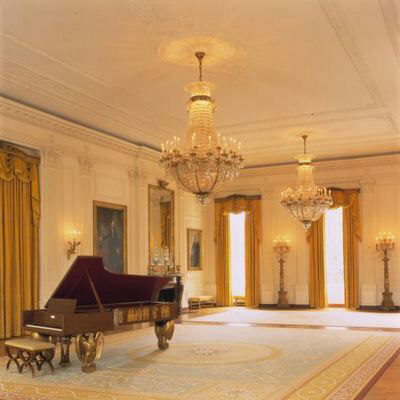 The East Room with the Steinway Grand Piano. The photograph left was taken in The East Room of The White House in the mid 1980's. I was setting up an antique urn on a wall table preparing for an evening holiday reception. (I looked in the elegant wall mirror to see if I aged a little while worrying to meet the deadline for this formal reception). Sometimes when I was decorating the mansion on the State Floor and in the rooms, and no "VIP's" are in the area, (Especially The President or First Lady), I would remove my suit jacket, role up my sleeves and get deep into the business of decorating this graceful, most elegant room, feeling very comfortable as if it was my own home, sometimes, I think it was my second home, I was there so many years. Whenever The President or First Lady would enter the room that I was working in, I would quickly role down my sleeves and place my suit jacket back on for a more respectful dress attire presentation. (Notice the Christmas Wreath refecting in the mirror on the window paine). There were always fresh green wreaths hung in every window on the State Floor of The White House. The East Room, scene of many historic White House events, was designated by architect James Hoban as the "Public Audience Chamber" but quickly came to be called the "Banquet Room." The room is not quite 80 feet by 37 feet and normally contains little furniture. It is traditionally is used for large gatherings, such as dances, receptions, concerts, weddings, award presentations, press conferences, and bill-signing ceremonies. It is here that presidents are commonly inaugurated in private before proceeding to the Capitol for an official, public inauguration. It is here also that presidents, vice-presidents, and other dignitaries are sometime lain in honor prior to their funerals. Richard Nixon announced his resignation to his staff here. As the largest room in the house, it has sometimes served as a playroom. Tad Lincoln harnessed a pair of goats to a kitchen chair and took a ride through the East Room. During the Theodore Roosevelt administration, not only was First Daughter Alice married here, but the room also hosted a Chinese wrestling exhibition to entertain some 50 to 60 guests of the president (TR enjoyed wrestling top-rated Americans and even took jujitsu lessons). The exuberant Roosevelt children are also known to have used the East Room for roller-skating. Seventy-five years later, Jimmy Carter's daughter Amy's roller-skating adventure left marks that weren't repaired for another thirty years. The Steinway grand piano with gilt American eagle supports was given to the White House in 1938. The full-length portrait of George Washington that hangs here is one of several painted by Gilbert Stuart and has hung here (except during renovations) since 1800. In 1818, President Monroe purchased 24 chairs for the East Room from William King, a cabinetmaker in Georgetown. The Public Audience Room was not complete when the White House opened its doors in 1800. Abigail Adams famously hung laundry to dry here. And architect Benjamin Latrobe noted that the ceiling had fallen in sometime between 1800 and 1809. The room was finally complete in 1826. The East Room... is well known to most people by the common engravings of it. The ceiling is frescoed in a very ordinary style, cupids, flowers and such sprawling about overhead in a very loose manner, the unbreeched urchins looking as though a suit of Uncle Sam's uniform would not come amiss this cold weather. The lace curtains, heavy cords and tassels and damask drapery, have suffered considerably this season from the hands of relic-hunting vandals, who actually clip off small bits of the precious stuff to carry home as mementoes, I suppose. I wonder how they have the 'cheek' to exhibit their trophies to admiring friends at home and complacently relate how they stole them. Some of these aesthetic pilferers have even cut out small bits of the gorgeous carpet, leaving scars on the floor as large as a man's hand. Others, on larger game intent, have actually cut off a yard or two from the lower end of some of the heavy crimson satin window hangings. At times during the Civil War years, Union troops occupied the room. In 1864, the East Room was the scene of a large reception given by President Lincoln in honor of Ulysses S Grant shortly before his appointment as head of all the Union armies. 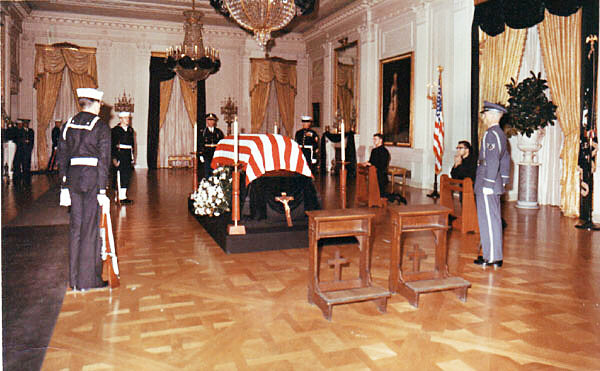 In April of 1865, the East Room was again filled with people, but this time they were mourners surrounding the body of President Lincoln after his assassination. Andrew Johnson's daughter quickly renovated the White House in the style of the time with geometric shapes. When Grant himself became president, his redecoration of the East Room in 1873 added two decorated beams supported by gold and white columns. The ceiling spaces between the beams were painted in blues and soft pinks to resemble the sky. It also included gray and gold wallpaper, new mantels and mirrors over the fireplaces, rows of columns, and new gas chandeliers larger than those installed by President Jackson. The remake resulted in Gilded Age decor hailed at the time as "pure Greek" but later ridiculed as "steamboat Gothic." When President Arthur redecorated the White House in 1882, Louis Tiffany found it necessary only to install silver paper on the ceiling of the East Room and to increase the number of potted plants, whereas elsewhere he installed Tiffany glass windows and plaster trim. All of the heavy Victorian adornments were swept away in the 1902 renovation. Today the East Room retains the late 18th-century classical style to which it was restored by architects McKim, Mead, & White during the Theodore Roosevelt renovation of 1902. An oak floor of Fontainebleau parquetry was installed at the time as were the bronze electric-light standards, upholstered benches, and three Bohemian cut-glass chandeliers. The walls were paneled in wood with classical fluted pilasters and relief insets. The paneling was painted white, and delicate plaster decoration was added to the ceiling. President George Washington's painting by Gilbert Stuart in the East Room at The White House. The famous painting that Dolly Madison saved during the White House Fire on August 24th 1814. LEFT TOP PHOTOGRAPH) I love this Creche on displayed in the East Room of The White House every Christmas. It is a White House tradition to see this when I use to travel there to decorate the rooms. I have always looked forward to viewing this beautiful elegant Nativity Scene and said a devoted prayer to The Holy Family when I was before this majestic display. In all the twelve years I have been at The White House decorating the mansion, I have never seen who the people were that assembled this great masterpiece in The East Room. As if it came in the middle of the night, placed there by angels, just like the birth of Our Savior. How I wish I could bring this back to New York with me and display it in my own home. It would be up all year round. (LEFT BOTTOM PHOTOGRAPH) This is an earlier display of the famous White House Creche during the 1970's. This one also was in the East Room and in the same place as the other Creche that was constructed later on in the 1980's. The White House always had just ONE grand Creche in The East Room every holiday season. This is an earlier display of the famous White House Creche during the 1970's. This one also was in the East Room and in the same place as the other Creche that was constructed later on in the 1980's. The White House always had just ONE grand Creche in The East Room every holiday season. There were plenty of poinsettia plants all around the Nativity display. It really added a finishing touch to the complete vision of this elegant presentation. This was my favorite set of the two of them. I stared at this beautiful creche for a long time dreaming of that most holy night. Would you like to perk up your own home Creche with some ideas to make it more "attractive" and spending very little amount in dollars for this project? It's very easy and I will explain in detail exactly what you can do to make your Nativity Scene a unique home display. If you have your Nativity placed on the mantle, or a table this set-up I am going to tell you about will have no effect on the presentation - it will work very well on both styles of display. Purchase some bright red poinsettia plants (about five to eight crown heads on them planted in six inch containers (your local garden store will have the best pick for a larger selection) - and cover the containers with gold foil. Place the plants all around the nativity set on high and low levels about three inches of height from each other. Keep them close together - about an inch apart from touching each other on the table or mantle. Take spanish moss, gray colors, and spread it around the manger up and around the base of the plants, (do not touch the stem of the plant) keeping most of the gold foil visible and interwined it around the statues. Place different assorted sizes of natural color pine cones in sets of three's on the spanish moss and around the complete set. Add a set in the manger behind the child and outside on the side of the manger. It would also look very nice to have some sets of pine cones in the base of the poinsettia plants for a final touch. This is a great rustic effect to have using these pine cones. Remember, the child was born in a stable. Add a light to the inside of the manger and your Creche presentation will have a most beautiful added touch. For a very unique additional touch - build your own manger, and find all the supplies you need right in your neighborhood park, jogging trail, or forest. Take pieces of forest wood tree barks, logs, sticks, a few small rocks and green moss. If the statues in your Creche are about eight to twelve inches high, the manger's height should be at least double the height of the largest statue. Be very careful if you have a candle lite near it that the flame of the candle is maintained with a cystal clear glass enclosed cylinder, and never leave a burning candle unattended. One tiny spark of a candle's flame can hit the spanish moss and cause a serious fire in your home. Always, use great caution with candles, and if I were you, don't light them up until Christmas Eve when you and your family and friends are gathering at home, in front of this display. There were many candles on display at The White House inserted in holiday arrangements during the Christmas season but never lite. Just used for decorative display purposes only. Beautiful holy figures, properly placed on a display with all the trimmings I directed you with in this chapter, will create in your home an exclusive nativity display for your family and friends to view and enjoy for years to come. Bona Natale! "It's amazing how so much wealth of American History is amassed under one roof". Frank Lazzaro's response to a Daily News reporter's question on what he thought of The White House. Christmas Eve Interview in the Ford Administration. Eugene Allen with The President and Mrs. Reagan during the 1980's. Eugene Allen, who endured a harsh and segregated upbringing in his native Virginia and went on to work for eight presidents as a White House butler, died March 31, 2010 of renal failure at Washington Adventist Hospital in Takoma Park. He was 90. I remember Mr. Allen so very well in my years at The White House while decorating the State Dining Room. He was a real, kind gentleman to me and made me feel so welcomed as part of the staff when I had the great honor of meeting him during my lunch and dinner breaks in The White House dining room. May he rest in peace with God.